Give your ankles that chic, artistic look with these Falke Cotton Touch Painted Circles Socks. Each pair is printed with a casual, yet confident brushstroke design that wouldn't be out of place in a modern art exhibition. These light, gorgeously soft socks feel like they’re barely there at all with a fine, smooth weave, yet are surprisingly strong, with reinforced toes for added durability. 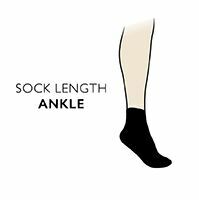 Cotton rich and breathable, you can be certain Falke Cotton Touch Painted Circle Socks will keep you comfortable while they’re looking pretty. Made in an ankle length, they’ll look great with skirts and cropped trouser styles.